Party Girl Loren Mayo takes us behind the scenes of author David Baldacci's recent visit to Sarasota for the Library Foundation Luncheon. Get ready to drool over our dessert of the month. Kelly Drost reopens her popular sandwich biz. A beloved chef is back in a new restaurant space. Are s'mores the new cronut? Plus, fresh produce from Sweetgrass Farms and a hot dish from Curry Creek Cafe in Nokomis. With a new clothing line debuting on HSN, Sarasota's Sigrid Olsen is reinventing her career. Sarasota Magazine fashion editor Heather Dunhill rounds up four of-the-moment fashion and beauty trends. Fresh new spring fashions for a Lido Beach getaway. Plus, a new breakthrough in kids' eye care, and are e-cigarettes helpful or harmful? Jessica Napoli of Mark Dalton Custom Design shares the latest trends. Advice for home builders, new home models and more. Sarasota Pool Featured on HGTV's "Amazing Water Homes"
A Siesta Key fantasy lagoon earns its spot on HGTV's "Amazing Water Homes." 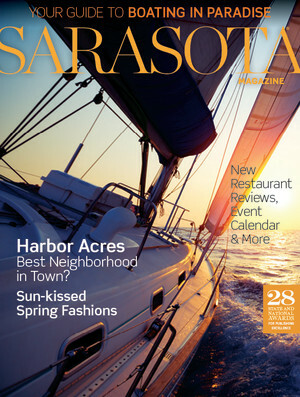 Is Harbor Acres Sarasota's Best Neighborhood? This enclave of quiet wealth may be the best neighborhood in town. Want to own your own private island? Here's how you can--and it's located just up the road in Ruskin. A Cortez group of wooden boat restorers takes on its biggest project yet. We live in a boater's paradise. Let's chart your course. Freaks, girlie shows and other gems of Americana at a new Gibsonton museum. Pam Daniel launches our boating issue with her very own shipwreck story.